The 17 days long 2010 Winter Olympics came to an end last night. The closing ceremony held in Vancouver BC Place featured a myriad of Famous Canadian talent. The line up included singers Avril Lavigne, Michael Buble, Alanis Morissette, Neil Yonge, Nickelback and actors Michael J Fox and William Shatner. Canada the host country won a total of 26 medals, with a record setting 14 gold medals the most won by any Olympic host country. 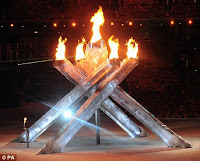 The Vancouver 2010 Olympic Cauldron flickered and then was extinguished by falling snow in BC Place.